All I can say is “Wow”. Insane. For some strange reason, that picture made me think of Lt. Dan from Forest Gump. Pure madness! This is the power of Death Metal! Death metal? The singer kinda looks like Eddie Vedder. Fantastic! Was a ramp required for stage diving? That happened at a gig I was at recently. The Subways and Twin Atlantic at ABC in Glasgow. Neither are particularly heavy (at least not by your standards) so imagine my amazement when people started crowdsurfing during the support act. Then imagine my utter bewilderment when a dude in a wheel chair surfed .. twice. That’s just pure awesome! Everyone likes to get their float on. Ive completely forgotten about Bolt-Thrower! Arent they the band based on a scfi boardgame and have lyrics about Aliens, Machine guns and the ‘Emperor’? Epic picture, how did he get up onto the stage to dive in the first place? 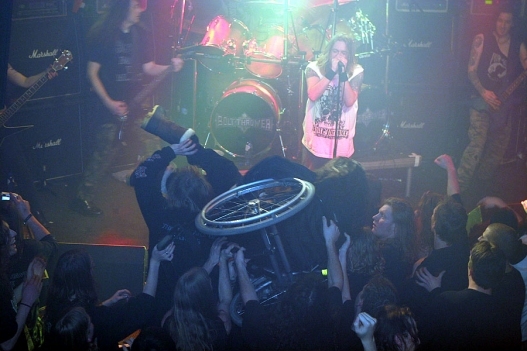 When I was wheelchair-bound, I was lifted up by some hardy men and carried aloft around a party. Pretty scary. Pretty awesome. This also happened while Bad Religion was playing at the Warped Tour in ’07. Band and crowd went crazy! Bolt Thrower are the Gods of War Death Metal!!!!!!!!! !